10 CARIBBEAN HOTELS THAT ARE FIT FOR A PRINCE - The Telegraph. MALLIOUHANA HOTEL & SPA LHW CNT. One of the finest resorts in the Caribbean since its opening in 1984. K-Club - (1989-2004). "Robert de Niro plans to restore luxury beach resort once favoured by Princess Diana." THE WESTIN RESORT & CASINO - "Imagine the sand beneath your feet and a soft steel drum playing in the background." THE ABACO CLUB - on Winding Bay, a Ritz-Carlton Managed Club. The Abaco Club's spectacular greens, designed by world-renowned links architects Donald Steel and Tom Mackenzie, offer a thrilling Bahamas golf vacation experience. The par 72 championship layout blends seamlessly with its natural surroundings, playing to a length of 7,183 yards. MUSHA CAY - the most private-island resort in the world. It is located 85 miles southeast of Nassau. It is owned by illusionist David Copperfield. OLD BAHAMA BAY HOTEL - luxury villa rentals in the Bahamas. SANDALS EMERALD BAY SDA. "Luxury Included Vacations." Royal Victoria hotel - was the best hotel on the island at one time. SANDALS ROYAL BAHAMIAN SDA. "Luxury Included Vacations." SANDY LANE LHW CNT. Luxury golf and spa resort. NECKER ISLAND - "My home - and favorite hideaway". Sir Richard Branson. Royalton Cayo Santa Maria - all inclusive luxury resort. Gran Hotel Manzana Kempinski La Habana - "Originally built between 1894 and 1917 as the first European style shopping arcade in Cuba, Gran Hotel Manzana Kempinski La Habana is situated in the heart of the old Havana with a direct view of the Capitol and the Great Theatre of Havana and amidst UNESCO World Heritage sites." HOTEL AMBROS MUNDOS - home to the popular writer Ernest Hemingway for seven years in the 1930s. HOTEL HABANA RIVIERA - built in 1957 and still maintains its original 1950s style. It has twenty-one floors containing 352 rooms all of which feature views of the water. The hotel was originally owned by mobster Meyer Lansky who had been inspired to build it after visiting his friend, Moe Dalitz's nine-storey Riviera Casino on the Las Vegas Strip. 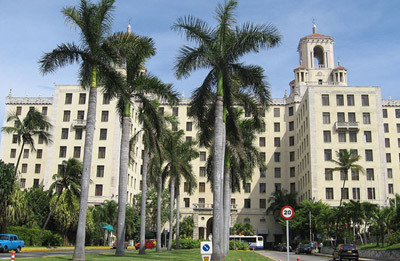 HOTEL NACIONAL DE CUBA - historic luxury hotel founded in 1930. Among its first illustrious guests were artists, actors, athletes and writers such as Frank Sinatra, Ava Gardner, Mickey Mantle, Johnny Weissmuller, Buster Keaton, Jorge Negrete, Agustín Lara, Rocky Marciano, Tyrone Power, Rómulo Gallegos, Errol Flynn, John Wayne, Marlene Dietrich, Gary Cooper, Marlon Brando and Ernest Hemingway. The hotel's reputation is backed by patrons such as Winston Churchill, the Duke and Duchess of Windsor, scientist Alexander Flemming. HOTEL INGLATERRA - founded in 1908. Hotel Plaza - one of Havana's oldest hotels. Grand Hotel BÁvaro - all inclusive luxury resort. The Reserve at Paradisus Palma Real - all inclusive luxury resort. Luxury Bahia Principe Cayo Levantado - 5-star all inclusive luxury resort. HOTEL OLOFFSON - "An Oasis in Port au Prince." The hotel was the real-life inspiration for the fictional Hotel Trianon in Graham Greene's famous 1966 novel The Comedians. SANDALS - "Luxury Included Vacations." 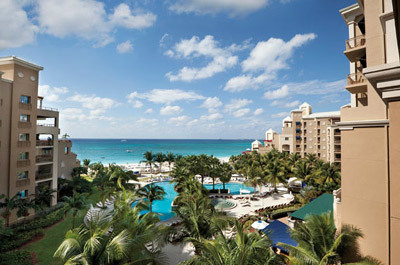 Grand Hotel Rose Hall - 5-star all inclusive luxury resort. HALF MOON - "Golf, Tennis and Beach Hotel." Myrtle Bank Hotel - (1874-1966). Harbour Street. Built in the mid-1800s, the Myrtle Bank, owned by Scotsman James Gall, was converted from a shipyard into a select boarding house. It was destroyed in the 1907 earthquake, reconstructed in 1918 and sold to the United Fruit Company. At that time it was the largest hotel in Jamaica with 205 rooms and a filtered salt water pool. "Jamaica’s long-time, world-famous hotel, the stately Myrtle Bank is gutted by fire in one of the most spectacular blazes in Kingston’s history on February 27, 1966." - The Gleaner. 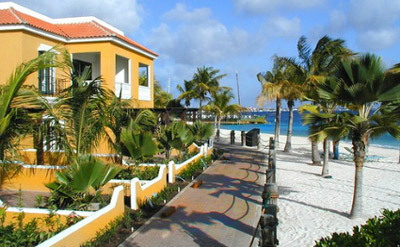 SANDALS CARLYLE - "Luxury Included Vacations." 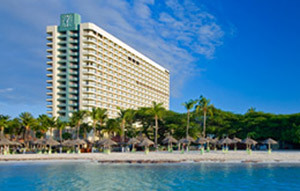 SANDALS MONTEGO BAY - "Luxury Included Vacations." SANDALS ROYAL CARIBBEAN RESORT & PRIVATE ISLAND - "Luxury Included Vacations." SANDALS NEGRIL BEACH RESORT & SPA - "Luxury Included Vacations." SANDALS OCHO RIOS BEACH & VILLA GOLF RESORT - "Luxury Included Vacations." SANDALS ROYAL PLANTATION LHW SDA. Sandals' first boutique resort. Goldeneye - Fleming Villa - the late Ian Fleming's estate in Oracabessa, Jamaica. Rents for US$6,600 per night. GOLDENEYE Hotel & RESORT - of Ian Fleming / James Bond fame. FIREFLY MUSTIQUE - "Not a Hotel - an Experience." MUSTIQUE - "The world’s finest private-island retreat." JADE MOUNTAIN - rated #4 best hotel in the world by TRAVEL + LEISURE MAGAZINE. 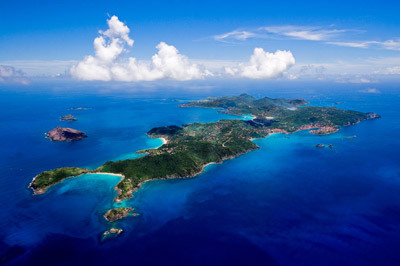 ST. VINCENT & THE GRENADINES - Wikipedia. The Pink Sands Club - "Unashamedly romantic and wickedly glamorous!"